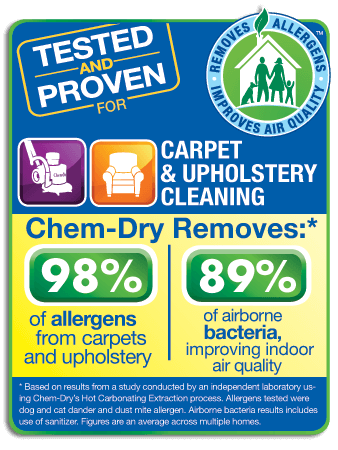 Chem-Dry’s revolutionary cleaning approach provides you and your family with a healthier, deeper, and longer-lasting carpet cleaning experience. McGeorge Brothers Chem-Dry uses the power of carbonation to break up the dirt and allergens stuck deep in your carpet’s fibers. These unwanted particles are raised to the surface and then whisked away by our powerful extraction equipment. Chem-Dry uses up to 80% less water than typical steam cleaning and helps prevent the growth of mold and mildew under your carpet. Not to mention, our carpet cleaning has a much quicker drying time! Check out this short video to learn more about how our unique cleaning process works. The McGeorge Brothers Chem-Dry of Kansas City carpet cleaning process uses 80% less water than typical steam cleaning, so carpets dry within hours, not days. This helps you avoid the huge inconvenience of having to tip-toe around wet carpet for days and you and your family get back to being comfortable in your own home much sooner. See a full comparison of Chem-Dry vs steam cleaning to see all of the benefits of choosing Chem-Dry carpet cleaners. Our primary cleaning solution is carbonated and works like club soda to penetrate deep into your carpet’s fibers. The carbonation lifts the dirt and grime from the very bottom of your carpets and brings it to the surface before being whisked away by our powerful extraction equipment. Other carpet cleaners often leave behind dirt-attracting soap residue after they use steam cleaners in your home. Our revolutionary Chem-Dry carpet cleaning gives you a thorough clean without leaving any of that soap residue behind. Our carpets stay cleaner, longer! Because of our minimal-water method, there is far less risk of mold and mildew growth under your carpet which is often the result of steam cleaning’s excessive water use. We use a green-certified cleaning solution that does not contain any harsh soaps or chemicals and is completely safe and non-toxic for your family and your pets. Additionally, an independent air quality lab found that our HCE method removes 98% of common allergens in your carpets and upholstery. When a sanitizer is added, 89% of bacteria is removed from your indoor air*. That all adds up to a safer and healthier carpet cleaning for you, your family, and your home. 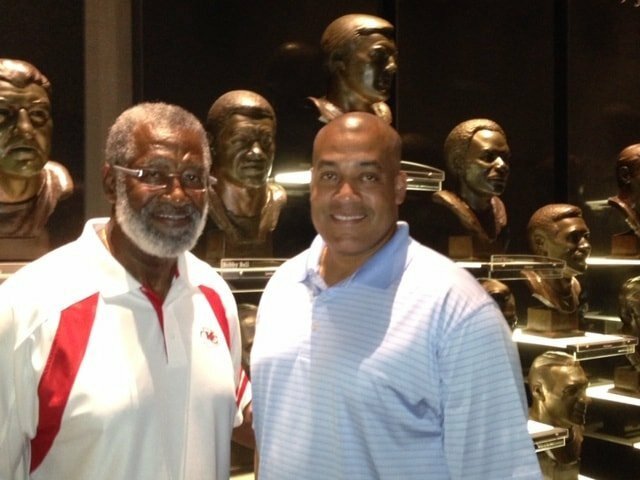 For a Hall of Fame carpet cleaning experience please contact my son, Bobby Bell Jr. and schedule an appointment. His commitment to customer service and dedication to excellence are like none other. I could not be more proud to recommend Bobby Bell Jr. and McGeorge Brother’s Chem-Dry of Kansas City. Chem-Dry’s signature carpet cleaning solution, The Natural®, is our green-certified cleaner that is non-toxic and ideal for homes with kids and pets. It doesn’t leave behind any dirt-attracting residue meaning a longer lasting clean! Our deep and healthy carpet cleaning service is sure to exceed all of your expectations. Chem-Dry is preferred by customers and professionals alike. The Carpet and Rug Institute (CRI) designated Chem-Dry as a company deserving the CRI Seal of Approval for our Hot Carbonating Extraction carpet cleaning system. The CRI identifies effective carpet cleaning solutions and equipment that clean carpet right the first time. Our products and services help protect a home or business’s carpet investment. The blue and green CRI Seal of Approval is proof that you are investing in a trusted, quality carpet cleaning service. Call McGeorge Brothers Chem-Dry Today! My carpets look new again. Very thorough hardworking and professional. Friendly and knowledgeable about carpet wear and it’s care. I couldn’t ask for better a carpet cleaning service. I would definitely recommend McGeorge Brothers Chem-Dry. Thank you Bobby Bell Jr.
We’ve had Bobby to our house twice. Once for dog accidents and once for permanent black sharpie marker on my newly carpeted stairs, (courtesy of my one year old with quick hands). Needless to say, no more dog smells and there is not a black mark to be seen! Bobby is amazing! And his customer service is top notch. We won’t be looking anywhere else when we need help with our carpets. MISSOURI: Lee's Summit, Blue Springs, Kansas City & Raytown. KANSAS: Leawood, Overland Park, Mission Hills, Shawnee & Mission. Mon-Fri: 8:00 am - 6:00 pm. Available Sat & Sun by appointment. © McGeorge Brothers Chem-Dry 2019. Independently owned & operated in Kansas City /// Site designed by Kite Media.